Sociologists have long noted that dynamism is an essential part of the urban way of life. However, walking as a significant social activity and crucial research method (in spite of its ubiquity as part of urban life) has often been overlooked. 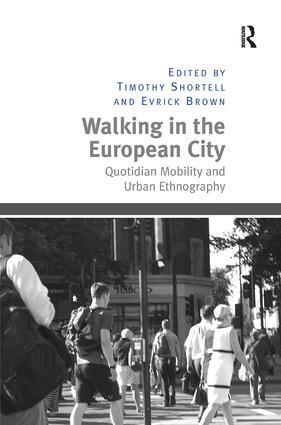 This volume considers walking in the city from a variety of perspectives, in a variety of places and with a variety of methods, to engage with the question of how walking can contribute to the sociological imagination and reveal sociological knowledge. Bringing together new research on sites across Europe, Walking in the European City addresses the nature of everyday mobility in contemporary urban settings, shedding light not only on the ways in which walking relates to other social institutions and practices, but also as a method for studying urban life. With attention to intersections of race and ethnicity, gender and class, as well as the manner in which processes of gentrification transform urban space, this book examines questions of access to public places, exploring the ways in which urban dwellers’ use of and relation to neighbourhood spaces are shaped by inequalities of status and power. As such, it will appeal to scholars of sociology, geography and anthropology with interests in urban studies, mobility and research methods. Timothy Shortell is Associate Professor of Sociology at Brooklyn College, City University of New York, USA and co-editor of The World in Brooklyn. Evrick Brown is an Adjunct Assistant Professor in the Behavioral Sciences and Human Services Department at Kingsborough Community College of the City University of New York, USA.